Henry Wadsworth Longfellow (1807 – 1882) was America's most beloved nineteenth-century poet, rivaling in popularity the contemporary English poet Alfred Lord Tennyson. Influenced by the romantic novelists James Fenimore Cooper and Washington Irving, Longfellow helped to fashion a national literature based on American myths, history, and landscapes in poems such as "The Song of Hiawatha," "Paul Revere's Ride," "The Courtship of Miles Standish," "The Village Blacksmith," and "Evangeline." By the end of his life, Longfellow was among the best known Americans in the world. With vivid imagery, and rhyming, diction, and meter that made his verse easy to memorize, Longfellow's works penetrated popular culture to an unprecedented degree. His poems were recited in parlors and classrooms and at civic ceremonies, while schoolchildren celebrated his birthday as if it were a national holiday. Some of his lines, such as "Ships that pass in the night," have entered into contemporary English usage and inspired composers such as Franz Liszt, Edward Elgar, Felix Mendelssohn, and Charles Ives. Longfellow also authored the first American translation of Dante Alighieri's Divine Comedy, and was one of the five members of the group known as the Fireside Poets. Longfellow was influenced by his Unitarian beliefs, his association with New England Transcendentalists, and the Romantic literary movement he encountered in Europe. He believed that the vitality and originality of American literature must depend upon the nation's natural environment and distinct history, as opposed to the long-standing cultural and social traditions that informed European literature. Longfellow's poetry fell out of critical favor at the beginning of the twentieth century with the rise of literary modernism and its preoccupation with psychology, social dislocation, and political ideology. Despite his often-sentimental tone, Longfellow remains popular for his evocation of a vanishing America, its landscapes and occupations, and his simple affection for humanity. Longfellow was awarded honorary doctoral degrees from Oxford and Cambridge universities, and after his death was the first American to be included in Poets' Corner of Westminster Abbey in London. Longfellow was born in 1807, the son of Stephen and Zilpah (Wadsworth) Longfellow. He was the second of seven children. He was born and grew up in what is now known as the Wadsworth-Longfellow House, a Federal style house that was located on the corner of Hancock and Fore Streets in Portland, Maine. The house was demolished in 1955. Longfellow's father was a lawyer and congressman and his maternal grandfather, Peleg Wadsworth Sr., was a general in the American Revolutionary War. He was descended from the Longfellow family who came to America from Otley in Yorkshire, England, and from Priscilla and John Alden, a Mayflower Puritan couple on his father's side. The Longfellow family faith was Unitarian, and Henry's younger brother, Samuel, became a minister in the Unitarian church. Samuel Longfellow later wrote Henry's biography and commented about his brother's spiritual life: "It permeated his life. His nature was at heart devout: His ideas of life and death, and of what lies beyond, were essentially cheerful, hopeful, optimistic. He did not care to talk much on theological points, but he believed in the supreme good in the world and in the universe." Longfellow was enrolled in a "dame school" at the age of three and by the age of six, when he entered the Portland Academy, he was able to read and write very well. He remained at the Portland Academy until the age of fourteen and entered Bowdoin College in Brunswick, Maine, in 1822. At the age of nineteen he graduated fourth in a class of 38 students. At Bowdoin, he met Nathaniel Hawthorne, who became his lifelong friend. After graduating in 1825, he was offered a professorship at Bowdoin College with the condition that he first spend some time in Europe for further language study. He toured Europe between 1826 and 1829, and upon returning, went on to become the first professor of modern languages at Bowdoin, as well as a part-time librarian. During his years at the college, he wrote textbooks in French, Italian, and Spanish, and a travel book, Outre-Mer: A Pilgrimage Beyond the Sea. In 1831, he married Mary Storer Potter of Portland. In 1834, Longfellow was offered the Smith Professorship of French and Spanish at Harvard with the stipulation that he spend a year or so in Europe to perfect his German. Tragically, his young wife, who had accompanied Henry to Europe, died during the trip in Rotterdam, after suffering a miscarriage in 1835. Mary was only 22 years old when she died. In 1838, he wrote a touching poem, "Footsteps of Angels," in her memory. Longfellow continued his travels for about a year after Mary's death. During this time Longfellow came under the influence of German Romanticism. When he returned to the United States, he took up the professorship at Harvard University (1836-1854) and began publishing his poetry, including Voices of the Night, in 1839, and Ballads and Other Poems, which included his famous poem "The Village Blacksmith," in 1841. Longfellow was a devoted husband and father, with a keen feeling for the pleasures of home. But his marriages ended in sadness and tragedy. 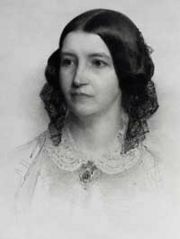 After his first wife died, Longfellow married Frances "Fanny" Appleton in 1843, daughter of the merchant Nathan Appleton, who bought the Craigie House overlooking the Charles River as a wedding present to the pair. While he was courting Miss Appleton, he frequently walked from Harvard to her home in Boston, crossing the river via the West Boston Bridge. That bridge was subsequently demolished and replaced, in 1906, by a new bridge, which was eventually renamed as the Longfellow Bridge. His love for Fanny is evident in the following lines from Longfellow's only love-poem, the sonnet "The Evening Star," which he wrote in October, 1845: "O my beloved, my sweet Hersperus!/ My morning and my evening star of love!" Their home became a meeting place for students as well as literary and philosophical figures, such as Ralph Waldo Emerson, Nathaniel Hawthorne, Julia Ward Howe, and Charles Sumner. During their happy marriage, Longfellow sired six children (two boys and four girls). Longfellow settled in Cambridge, where he remained for the rest of his life, although he spent summers at his home in Nahant. He retired from Harvard in 1854, devoting himself entirely to writing. He was awarded an honorary doctorate of Laws from Harvard in 1859. Henry Wadsworth Longfellow died March 24, 1882, and is buried at Mount Auburn Cemetery, Cambridge, Massachusetts. In 1884, he was the first American poet for whom a commemorative sculpted bust was placed in Poet's Corner of Westminster Abbey, in London. Longfellow's home in Cambridge, the Longfellow National Historic Site, is a U.S. National Historic Site, National Historic Landmark, and on the National Register of Historic Places. A two-thirds scale replica was built in Minneapolis, Minnesota at Minnehaha Park and once served as a centerpiece for a local zoo. Early on, Henry Longfellow's talent and passion for writing was greatly influenced by his reading of Washington Irving's Sketchbook. The Portland Gazette published Henry's first poem, "The Battle of Lovell's Pond," when he was just a young teen. Longfellow's work was immensely popular during his time and still is today, but many modern critics consider him too sentimental. His poetry is based on familiar and easily understood themes with simple, clear, and flowing language. His poetry created an audience in America and contributed to creating an American mythology. In his majesty of language and mastery of craft, Longfellow's works connected to the national conscience and imagination. Some of Longfellow's works were set to music by the composers Liszt (introduction to The Golden Legend), Elgar, Mendelssohn, and Ives. He wrote the Unitarian hymn, "All are Architects of Fate." The familiar Christmas carol, "I Heard the Bells on Christmas Day," was derived from Longfellow's poem, "Christmas Bells," which he penned on Christmas day in 1864. It was put to song by John Baptiste Calkin in 1872. The famous carol has two stanzas from the original poem omitted which reference the civil war. "Christmas Bells" reflects on the prior years of the war's despair, while ending with a confident hope of triumphant peace. "The Song of Hiawatha," one of Longfellow's most notable works, is a classic example of how he wove a piece of mythology of Native America into the tapestry of American folkloric legend. The almost ritualistic and exotic language of "Hiawatha" was composed of a measured meter based on the Finnish epic poem, called the Kalevala. The much loved "Evangeline" also was written in a unique meter, resonant of the epics of Homer and Virgil. Longfellow was a contemporary of some of the most influential trailblazers in the realm of literature and new political and spiritual movements of his day. Although Longfellow was not a rebel activist himself, he was a friend or colleague of those who were closer to the action of the American Renaissance. Ralph Waldo Emerson, Henry David Thoreau, Margaret Fuller, and Nathaniel Hawthorne were Unitarian Transcendentalists in Longfellow's circle of peers and friends. In 1842, Longfellow appeared to give his support to the Abolitionist movement when he wrote Poems on Slavery. In the years just before the outbreak of the American Civil War, Longfellow published his antiwar poem, "The Arsenal in Springfield," which became well known in that era as a plea for peace. Overall, Henry Longfellow did not use his creative pen to express partisan political views or religious dogma, but instead chose to use his talent to tell stories of a romantic, nostalgic, and picturesque nature which could move the hearts of the everyday people. 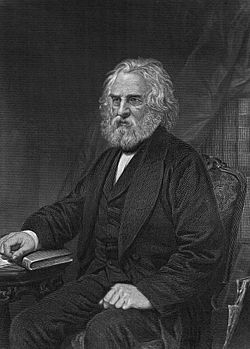 Henry Longfellow maintained a special friendship with Nathaniel Hawthorne, who gave Longfellow his inspiration to write "Evangeline," one of Longfellow's most loved works. Later, Longfellow gave a favorable review, to successfully launch Hawthorne's Twice Told Tales. James Russell Lowell and Charles Eliot Norton were also friends and colleagues of Longfellow who spent time together critiquing and discussing their ideas. In Boston, in 1857, Henry Wadsworth Longfellow, along with Ralph Waldo Emerson, Oliver Wendell Holmes, Sr., and James Russell Lowell founded what was to become one of the most enduring of all literary and cultural publications in America, The Atlantic Monthly (also known as the Atlantic). Several of Longfellow's poems were first published in The Atlantic Monthly, including "Santa Philomena," "Paul Revere's Ride," and the "Leap of Roushan Beg," among others. Most of Longfellow's works were highly regarded by critics, which won him respect, recognition, and great honors during his lifetime. Even the British monarch, Queen Victoria, invited him to have a private visit at tea with her. Longfellow also had his detractors, and Edgar Allen Poe was the most outspoken. He criticized Longfellow's "Voices of the Night," and even accused Longfellow of plagiarism in his poetic drama "The Spanish Student." Other critics of the time challenged this charge of Poe's as a huge exaggeration. In the round-tower of my heart." Ballads and Other Poems (1841): including "The Skeleton in Armor," "The Wreck of the Hesperus," and "The Village Blacksmith"
Tales of a Wayside Inn (1863): including "The Ride of Paul Revere"
Voices of the Night (1839): including "The Psalm of Life" and "Footsteps of Angels"
↑ Maine Historical Society, "Henry Wadsworth Longfellow: An Overview” Retrieved December 21, 2007. ↑ Eastern Illinois University, The Dame School Retrieved November 9, 2007. ↑ Longfellow National Historical Site, Craigie House Retrieved November 9, 2007. ↑ Dawn L. Stewart, Henry Wadsworth Longfellow Retrieved November 9, 2007. ↑ National Park Service, Longfellow Retrieved November 9, 2007. ↑ Minneapolis Parks and Recreation Board, Minnehaha Park Retrieved November 9, 2007. Works by Henry Wadsworth Longfellow. Project Gutenberg. Henry Wadsworth Longfellow Collected poetry online. Stewart, Tom. The Story Behind "I heard the Bells on Christmas Day." Dec. 20, 2001. History of "Henry Wadsworth Longfellow"
This page was last modified on 19 December 2017, at 17:41.